A little over a week ago, I sent my creativity students out on a sort of scavenger hunt. We had been studying Michael Michalko's approach to creativity called the SCAMMPERR method (Substitute, Combine, Adapt, Magnify, etc.). Divided into teams and armed with digital cameras, I sent them to the mall of their choice to find one example of each of the nine elements we discussed. Less than a half hour after I sent them out, one of my students called, informing me that mall security at one of the local malls would not let them take pictures inside the mall. I thought it was odd, never having had this problem in the past, so I told her team to do what they could with what they had (a teachable moment for creativity). The next morning, I received a voice mail from the general manager of Merle Hay Mall (the place of trouble from the prior evening), explaining that there had been an issue with my students. I returned her call promptly, and I proactively and sincerely apologized for any issues and inconvenience there may have been, taking the time to briefly explain the context in which they had been sent to the mall in the first place. With most people in the retail service industry, that would have been enough, and I would have received a "Thank you for returning my call, and thank you for understanding." Nope. She had a SPEECH prepared for me. She informed me that HER mall was PRIVATE PROPERTY, and that my students were BELLIGERENT. I stopped her and asked if she could provide examples of the belligerent behavior, in case there were specific classroom management issues to deal with. She could not, other than to let me know that her security guards were inconvenienced. Then she proceeded to let me know that her FIRST PRIORITY was to her NATIONAL FRANCHISES. I again simply apologized, and assured her I would research the issue further and she would not be troubled by my students any more. This seemed to please her, and the call ended. My students were incensed by her accusations. For starters, groups at other malls did not have run-ins with mall security. If questioned, they explained the assignment and the guards did not hinder them. Second, belligerence (like beauty) appears to be in the eyes of the beholder, because they felt harassed by the guards from the second they came into the mall. Third, the individual store owners from whom they asked permission were thrilled to have their store featured in an assignment about creativity. 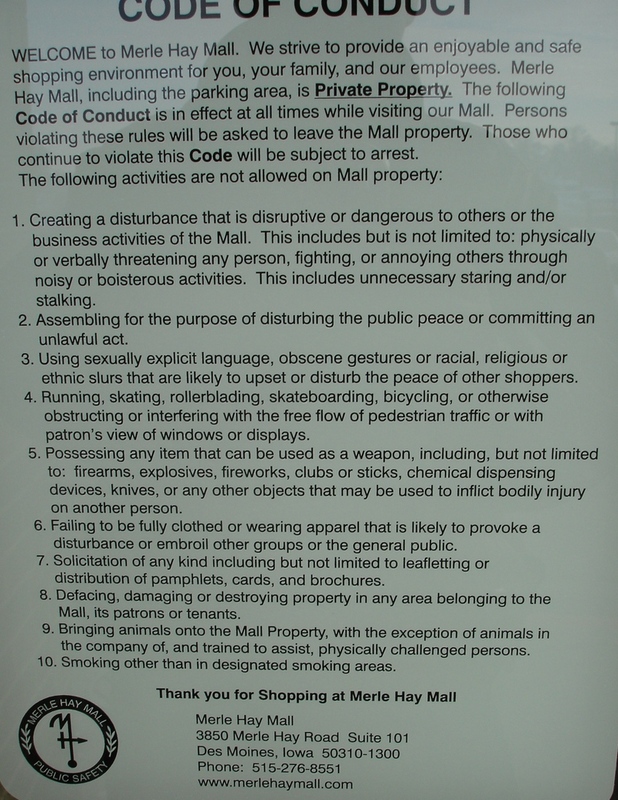 And finally, I went back to the mall and photographed their posted code of conduct myself. 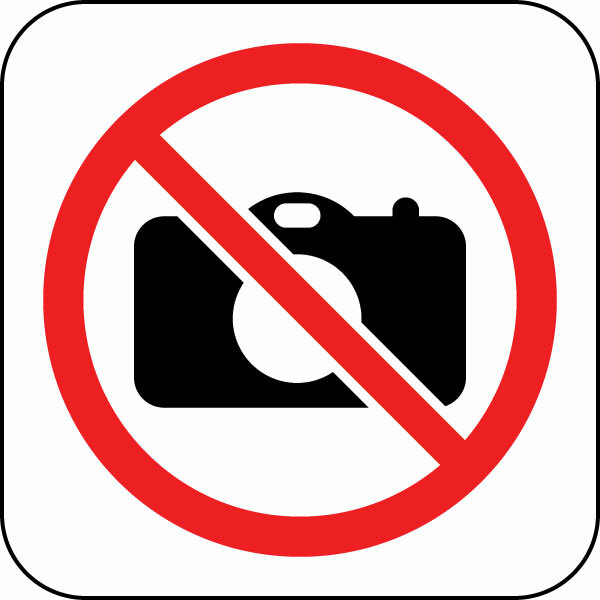 There's no mention of a photography ban listed anywhere. How many of us follow "made up" rules that really aren't rules at all? They're sacred cows that are mooing and stinking up the pastures of our accomplishment. How many people are incapable of separating the rule from the people involved? My students were not the teenage gangs I usually see loitering at the mall; they're accomplished professionals in their 20's through 50's with disposable income (don't stores generally want that type of person to come in?). Why is it that people in authority let it go to their heads? While I'm not going to fault a minimum-wage mall security guard from doing what he's been told, it seems odd that a mall general manager would get her jollies by scolding a person who has access to sharing this story with a whole lot of people. How can we get these people in authority to get their priorities straight? Yes, I understand the whole landlord-tenant thing, and I get the legality of private property. However, I always thought the goal of a mall was to get people into the door so they would spend money. Telling me that I, as a potential customer, was not only not her priority, but also that my students and I weren't welcome in HER mall (yes, the personal pronoun was used), that threw me as a paradigm shift. I guess I'd be curious how Old Navy, Pac Sun, American Eagle, or Wilson's Leather feel about their landlord's approach. Do Target and Kohl's and Sunglass Hut and Victoria's Secret really want to be protected from all of that evil paparazzi? Are Finish Line and Footlocker and Sprint and U.S. Cellular happy that young professionals with disposable income will not be shopping at their stores now? Are Brodkey's, Kay Jewelers, Franklin-Covey, and Lenscrafters appreciative of the job that security is doing supposedly to make their mall a better place? Don't worry, Merle Hay Mall, I take accountability for my students' actions. I've been spending this semester encouraging them to challenge the rules that don't make sense so they can tap into their creativity. They were just showing me that they were listening. I promise to do everything I can in the future to keep their alleged belligerence, their digital cameras, and their displosable incomes away from YOUR PRIVATE PROPERTY. It would be interesting to hear how Mike and Mike and Phil and Adam and Ann and Liz would have handled this situation if they were in my shoes. Wow - I was in a similar situation with my 14-year old son. We were in the King of Prussia (PA)mall. My daughter and I went in to Victoria's Secret and my son wanted no part of that so he took a walk to find Spencers. He came back later telling me that Mall security had told him his shirt was offensive and he needed to turn it inside out. He went to the men's room - but just came out in a couple of minutes with his shirt unchanged and came to find me. It said "Stop Bitching Start a Revolution". I actually have the same one and my son laughed that he had bought a shirt I had gotten the year before! There is no mall code of contact or dress. I asked him to find the security guard and show him to me. We couldn't find him. I think they were just harassing a kid and wouldn't have dared do it if I had been there. I should have called them or found the security guards - but I didn't we just went and had lunch. The staff at the restaurant heard us talking about what happened and were outraged. People don't get it - they don't understand that their acts are transparent now. We all get to talk about it quite publically. I had a horrible experience with HP this week and when I searched on "HP Hell" and "HP Customer Service" I found a ton of stories (which I linked to - see the trackback above). You just can't hide anymore!!! Is the Merle Hay Mall still open? I thought they shut down years ago! AFter hearing this story, I'll continue to think so. The only thing I'd have done differently is post HER name. A typical overreaction from rent-a-cop wannabees and mall managers who read about real problems and issues in other malls who develop a zero-tolerance attitude to anything other than people coming in with cash or credit cards. Methinks you have a front-page or metro-section story here for your local newspaper. THAT publicity ought to be real interesting for the mall weenies...I say go for it! Ann, you are so right about conversations being transparent. I could easily just "tell" a lot of people about my Merle Hay Mall experience (and have), but after validating what really happened with my students, I felt that it needed to enter the broader conversation. Your HP posts have been nothing short of brilliant. I've quit buying the major brands like Dell and HP for that very reason. For the last four years I've been ecstatic with my locally owned custom-build shop. Hmmmm... the newspaper... now that would make their socks curl over at MHM. Mike... I'm guessing I may not have to post her name. The ego behind that conversation will probably reveal itself. According to the mall website, HER family has been managing HER mall since it opened 50 years ago. Is it any wonder it's in the cellar? I wonder if a group of senior citizens with cameras would have had the same negative experience? I'm teaching a class on Diversity and hear from my traditional college age students that they are often discriminated against in retail settings. I'm guessing that given the mindset of mall management, they would be "equal opportunity offenders." It might have been one thing if these had been traditional college students in their late teens and early 20's, but I was just perplexed that "normal, everyday adults" were being given a difficult time. Tim recently wrote: "If we truly want to make an impact on the behaviors of those around us, we need to begin by changing our own behaviors and tailoring our approaches to meet the motivations of those around us. Taking the time to understand the office politics situation an invaluable investment." I believe the mall manager tipped her cards several times so we can understand her motivations. When she said her first priority is to the national franchises, she did not say "the franchises want me to insure customer satisfaction" or "they want me to protect the reputation of the mall because that has a direct impact on store revenue". Her belligerence belies a situation where she is under the gun, pressured by power trippers and not getting understood. She is perpetuating a chain of pain (where the boss chews out the subordinate who goes home and yells at his/her spouse who turns around and disses the kid that kicks the dog that chases the cat). She must be getting treated in a way that gives her anxiety and increases her stress level. She appears to be displacing her anxiety and misdirecting her anger. She is acting like her higher ups in mall ownership and the leaseholders are abusive. They are telling without listening, barking orders and intimidating her. If she was feeling understood, she would seek to understand Tim. if she was in two way conversations with her superiors, she would dialogue with Tim. If she were feeling supported from above, she would serve the customers of "her" mall. When we are backed into a corner, we lash out. When we feel every mistake will get caught, but nothing good we do gets noticed, we want to hide. When we are expected to conform but ridiculed when making suggestions, we shut down. When no one thinks of us, we find it impossible to think of others. When our managers treat us like enemies traitors or spies, we become hyper vigilant, defensive and suspicious. Every enterprise that treats their customers as enemies are beholden to investors, quarterly earnings growth and cost reductions. Watching their spreadsheets closely -- blinds them to the impact of their myopia on customers, their reputation, the word-of-mouth advertising and missed opportunities to make a positive difference in their markets. When we are ashamed of the job we are doing, we fear exposure by a camera, journalists or complaint cards from customers. When the mice play while the cat is away, the fear of word getting back to the cat is enormous. When are hoping to not get caught, everyone looks like a potential threat. When our fears are coming true, we become paranoid and vindictive. Welcome to the mall manager's nightmare! Tom, you are too cool. It's rare that I've had a reader quote me back to myself. Your analysis of the situation was well thought-out and well stated. I know that Merle Hay Mall touts themselves as having the same family manage them for the last 50 years (since the mall's opening). I'm not sure if management implies ownership in this case, though. One of the other motivators is that the mall has been on the downhill slide for years. The perceptions of the mall by some is that it is run-down and not well maintained. When our newest mall opened in 2004, Merle Hay made numerous legal maneuvers to try and block it. So... it would appear there are many motivators at play here. 1. Spread the word about what happened. 2. Contact your local newspaper and see if they'd like to do a story on what you're doing in your classroom and the troubles at the mall. 3. Call a morning radio show; they love stuff like this. 5. Teach your students about civil disobedience. Peter - Welcome to the conversation! I'm enjoying your list immensely. I'm not "bucking for tenure" at the college, since I'm an adjunct and enjoy staying in that status, so if this brings about the end (I doubt it will), so be it. And my day job is self-employed independent consultant, so if I fire myself, I guess I have more problems than I realized. Thanks for the thought-provokers...! Interesting scenario, Tim. I'm sorry for chiming in late! You got quite the convo going here! Stories like this just make me shake my head. I've never seen the trouble in having people visit your place of business. In my opinion, if you are running a retail location that is heavily dependant on foot traffic; you should always be accepting of foot traffic. In this case, since I wasn't there, I'm making the assumption that your students were not belligerent... Which leads me to believe that this general manager overreacted terribly. So... How would I have handled this situation...? Honestly, I think I would let her work herself out of a job. I'm willing to bet that happens sooner than you think, but I also wouldn't try to speed that process up. She's in the wrong position and like most biz owners/managers/whatever... the marketplace will determine their fate. I hope this situation resolves in a good way because I hate watching businesses fail. How's that for a political answer?! A students viewpoint, I have been smiling as I read through all the comments and wonder which group did security think was belligerent? Did anyone stop to think that our three different groups probably outnumbered all of the shoppers at the mall? What does that say about the Merle Hay Mall shopping experience? Possibly mall security had nothing else to do but harass the older students! The good news is that even though I live close I can shop at my favorite store, Target without entering the mall at all. Adam - thanks for weighing in. Very diplomatic answer, but it does leave one scratching his head. Randy - I doubt MHM will continue, especially if (even if it was justified from a legal perspective) mall security and mall management act as they do. On another note, I received an email response from another mall manager in another state. She was kind enough to explain (in a considerable more professional and genteel manner than the MHM GM did) the legal and social rationale for the actions. While she acknowledged that it's unfortunate that malls must cover themselves legally in our terrorist-threatened and litigious society, she provided very good rationale in a verey pleasant tone... And really, that was my point all along. I have nothing against policies. What I take exception to is the way the security guards TREATED my students, and the way the general manager TALKED to me. Those are the actions that spoke to the true character of Merle Hay Mall... when given the choice, I'll probably go to Jordan Creek or Valley West from here on out. Merle Hay made numerous legal maneuvers to try and block it. Let me share also my experience as a teacher. It is never easy to bring students into the outdoor activities. A teacher needs every possible consent from anyone concern.